From A to Z and Assembling to Winter Storage: here you’ll find lots of information and useful tips and tricks for using and caring for your TOPCAT. How do I place a gennaker? How do I properly set up the rudder? What is a mast rake, and who is this ITCA, exactly? With a little practice, the construction of a TOPCAT is done quickly, effortlessly and normally without tools. The TOPCAT hulls can be placed on the front spar and rear crossbar and tied tightly with the trampoline with a few handholds. On the water, the forces of the rig are used to create an extremely rigid hull-longeron connection - without drilling and screwing. When the mast is positioned, the helm is mounted on the brackets on the hull. A jib and, if necessary, gennaker are positioned, and after pulling the mainsail the cat is ready to cast off. This is an adjustment which, in order to shift the jib sheet lead further outwards, particularly when it has a broad reach, increases the effectiveness of the jib. It should only be used on boats without a gennaker. 2-way luff tensioner: with the 2-way transmission, it is possible to get more tension on the luff without much effort and therefore regulate the twist in the top and bunt. The 2-way luff tensioner is normally used for classic sails. 6-way luff tensioner: with this 6-way transmission you can trim Streamcut sails. With little effort, sufficient tension can be applied to the luff and twist in the square top. Diamonds are the real stays of the mast. With diamonds, the mast is given a pre-bending and the sail is blown better as a result. In addition, the diamonds stabilise the mast so that it does not bend too far to leeward or aft. ITCA stands for the International TOPCAT Class Association. 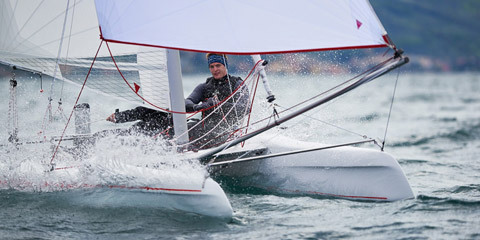 The International TOPCAT Class Association represents the interests of TOPCAT sailors, organises championships and maintains the class rules. Keel shoes are a tailor-made reinforcement made of GRP that protect the hull from excessive wear. They are particularly suitable where there are stony or rough beds. Firstly, all components have to be assembled according to the installation instructions. Even though the initial set-up takes some time, you should be diligent about it and not be in a hurry. The length of the sheets supplied with the reacher set is designed to be compatible with all TOPCAT types. That means that the halyard and the sheet must be adjusted and shortened to ensure trouble-free operation. Be sure to first raise the reacher (also called spinnaker or gennaker) on land each time before you go sailing to make sure it is set correctly. This will save you unpleasant surprises on the water. Before raising the spinnaker, the cunningham must be loosened - if fully tightened - otherwise the mast could break. Pull the spinnaker with the halyard out of the bag quickly and without interruption. If it stops or you sense increased resistance, don’t use force, as that could cause damage. Usually the halyard or sheet is fouled or someone is sitting or standing on it. Often, the halyard is pulled too hard, thus overstretching the spinnaker’s luff. To avoid this, either the halyard should be marked (e.g. using a light-coloured sewing thread) or a stop with a ball should be installed on the reacher ring of the mast. The course of the boat depends on the wind. The less wind, the more you can reach. But then the spinnaker will fill up and it becomes hard to pull it up completely. The more wind, the more you have to head down, although not directly downwind. Once the spinnaker is raised completely, the sheet should be brought under control as soon as possible. The helmsman could take care of this and then hand the sheet to the bowman. The better the coordination between the helmsman and the bowman, the smoother and faster the sailing will go. All manoeuvres have to become second nature and the same routine must always be followed without rushing or chaos. This is the only way to guarantee that nothing decisive is forgotten or done wrong. Unless this can be ensured, it makes no sense to go to the limit. Before raising the spinnaker, open the cunningham and slack off the jib, or if an auto-jibing device is mounted, leave it to itself. This allows the bowman to devote himself to the spinnaker. After raising the spinnaker, depending on the wind, slack off the main sail traveller and the main sail sheet and secure again. The mainsail is essential for the supporting effect of the mast. In case of a nosedive, always slack off the spinnaker sheet or let it fly, never release the main sheet, as that could destroy the mast. The bowman controls the spinnaker sheet and works under full concentration. The perfect angle of attack should always be sought. After the sail is raised, the helmsman heads up a bit in order to fetch the angle of attack and thereby speed, and then falls off somewhat again. You try to get as much depth as possible, without losing speed, always at the edge of the wind to lee. At the edge, or in case of a lot of traffic, always make sure that there is enough room to fall off to lee. Always look out for what can happen when sailing and don’t trust that you can still act at the last moment. At such high speeds, everything happens very fast and can go very wrong. The rules of right-of-way also apply when flying the spinnaker, and the excuse - there was nothing else I could do - is of no use. If the spinnaker has not been raised properly, it’s luffing and not producing enough speed, then try changing the tension on the luff with the halyard. Slacking off will flatten the spinnaker. When jibing, keep the boat's speed as high as possible, as this minimises the pressure on the sail and rig. Make absolutely sure that the spinnaker sheet is free, and then find the right angle of attack as fast as possible, so that the boat does not stall and have to be accelerated again. On the normal spinnaker course, the bowman slackens the spinnaker sheet slightly and hands it over to the helmsman to avoid uncontrolled beating of the spinnaker and sheet. The higher the wind, the more the helmsman falls off. If the wind is low, falling off is not only unnecessary, but even harmful. Now, the bowman pulls in the retrieval line slightly so it will have tension right away without slack. At the same time the cam clamp is released, and the sail is pulled in quickly without any delay or interruption. If it stops or you sense increased resistance, don’t use force as it could cause damage. Usually the sheet is fouled or someone is sitting or standing on it. Burn holes in the spinnaker usually occur when you’re sailing too low with not enough wind. If you’re not experienced at doing this, it helps to make sure the retrieval line is not on the lee side of the spinnaker when pulling the spinnaker in. So jibe to be on the safe side. Otherwise the spinnaker will get caught between the aluminium ring and the retrieval line and holes will be burned in the sail. If this should happen anyway, be sure to patch the spinnaker with tape at the next opportunity. The patch should be cut with well-rounded corners so that it will hold better. If the spinnaker and sheet are beating uncontrollably while the sail is being pulled in, the sheet can easily get caught under the tip of the bow. This must be prevented at all costs. The best thing to do is to slack off the sheet slightly and then hold it down with one foot. After 2 to 3 pulls on the retrieval line, the sheet can then be released. Beginners in reacher sailing are usually very concerned about capsizing and righting the boat, but don’t worry. The reacher first has to be recovered before trying to right the boat. In order to do this, first open the cam clamp. Then grab the halyard fastened behind the block of the trampoline and pull the spinnaker into the snuffer with it. Once this is done, you can right the boat as usual. As a starting point, both shock cords on each side should be released. As well the white grub screws should be loose so the rudder blades slide through the housing easily. Now fasten the upper grub screw by using a screwdriver so the rudder blade just stops sliding through. Now turn back the screw by a 1/4 turn. Repeat the process with the lower grub screw. While both shock cords are released on each side, the rudder blades have to move easily in vertical direction while the guideway should be free of play. For sailing tighten black shock cords on rudderhousing and release them after sailing to extend their life cycle. The name TOPCAT originated from the idea of transporting the TOPCAT right on top of the car. The idea of being able to take the small catamaran on holiday or to the swimming lake and assemble it within minutes without the need for tools was the secret behind the success of the TOPCAT. Changing customer needs and the cutting-edge knowledge from sailing experience have allowed the small cat to grow. 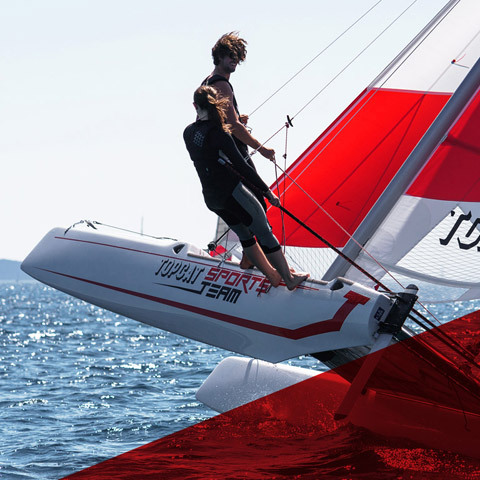 Although the fundamental idea has remained the same, the TOPCAT models today offer a wide range of uses and fun for single-handed sailors and entire families.